When the Seattle Centurion Studio opened in 2015, it covered a modest 3,100 square feet. 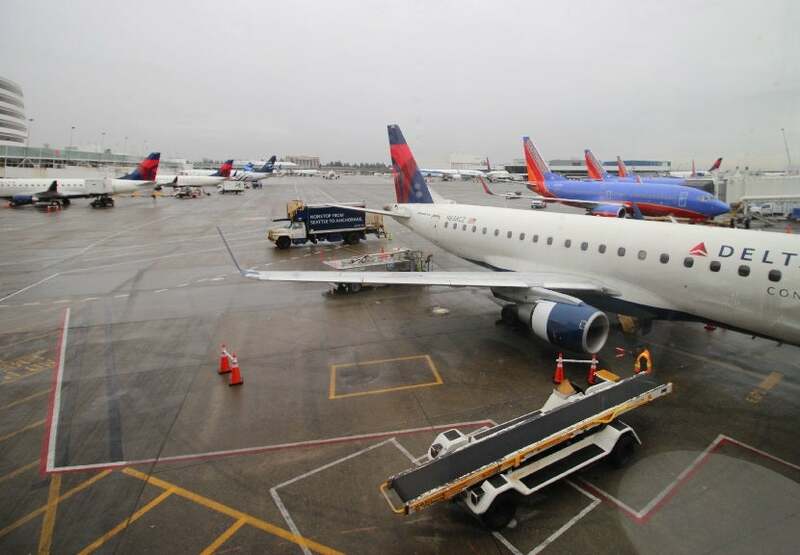 Offering less than half the space of most other Centurion Lounges, and despite having fewer amenities and a stricter guest policy, the lounge was often overcrowded. It was quickly apparent that American Express needed a larger footprint at SeaTac. And starting today, it has one. The revamped Seattle Centurion Lounge (no longer a “Studio”) opened for business this morning. 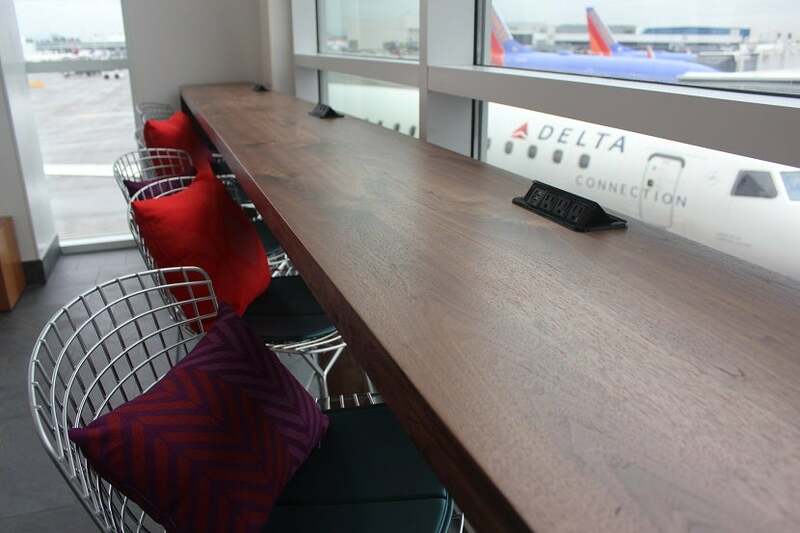 Along with an additional 1,400 square feet of space (4,500 total), the lounge has added several premium amenities that it lacked previously and reclaimed some of the impressive view that was cannibalized during construction of the new Delta Sky Club nearby. Amex still has long-term designs to open a much larger lounge space at SeaTac, but for now, the current offering has improved dramatically. The expansion juts out from the southwest corner of the existing lounge, where a wide, wood-paneled entryway opens to the bright, airy new room. The addition provides seating for 42, raising the lounge’s seated capacity from 61 to 103. That remains on the small side, and is sure to fill up quickly despite upcoming adjustments to the Centurion Lounge guest policy. Still, the expansion feels like it adds space beyond the additional square footage — the lower ceilings and boxy feel of the original room made the lounge feel smaller than it really was. New floor-to-ceiling windows look out over the tarmac between SeaTac’s A, B and S terminals, with Mount Rainier visible in the background (on a clear day). There’s a ton of natural light and plenty of opportunities for AvGeeks to watch planes coming and going. Unfortunately, the neighboring Sky Club permanently obscures the windows in the original lounge, so these new seats with a view are likely to be in high demand. Seating is mostly arranged around small cabaret tables for two, with several clusters that can serve groups of up to six people. You’ll also find a counter at the far end of the room, where seven high stools are set up with an outside view of Gate B4. 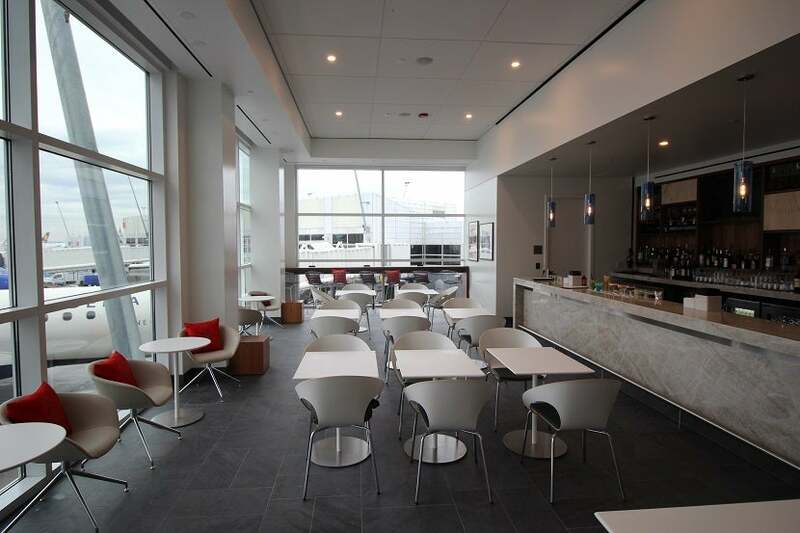 The most prominent new feature of the updated Centurion Lounge is the bar. Lining the wall and taking up a sizable portion of the new space, the bar forms a sleek L of white marble backed by the quintessential mishmash of luggage and books. Local laws prohibit seating at an open bar when minors are present, but you’re free to stand if you’re hooked to whatever’s on TV. The Seattle Centurion Studio previously offered a small selection of beers and wines (including several local options), which were served upon request by the table staff. 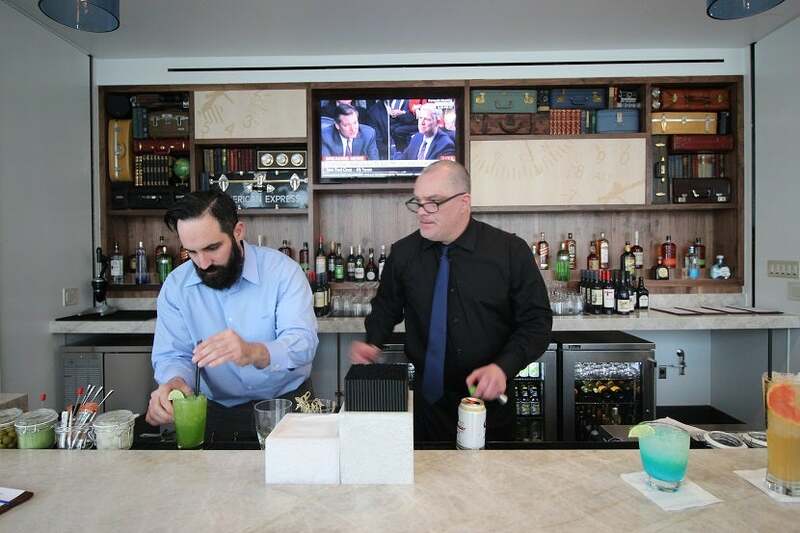 It now boasts a full-service bar with a full-time bartender, featuring a more extensive wine list — curated by Wine Director Anthony Giglio — and a hearty assortment of liquors. 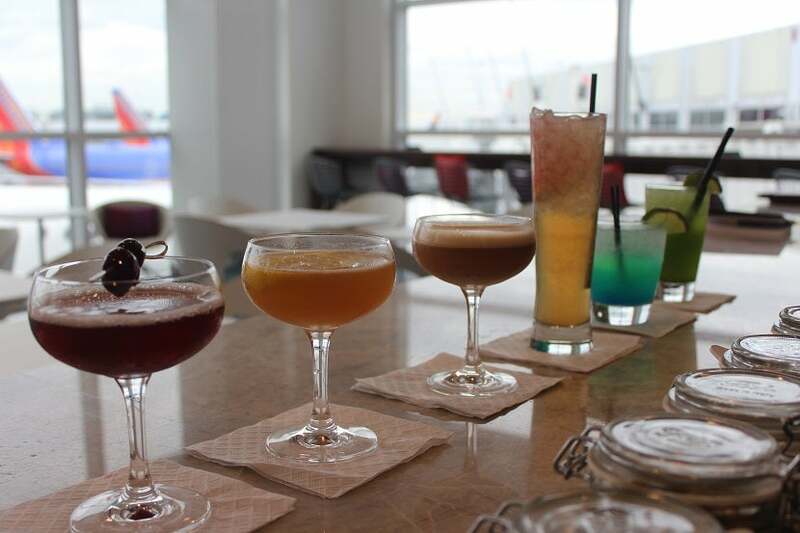 The eclectic cocktail menu offers a half dozen locally-inspired mixed drinks that are unique to the SeaTac lounge. The house Margarita, known as the Team Spirit, honors the Seattle Seahawks with a colorful mix of tequila, lime juice, Blue Curaçao and a dash of Mountain Dew, while the Capitol Hill — named for one of Seattle’s most prominent neighborhoods — is a twist on a standard Manhattan. My favorite was the sweet, hoppy I.P. Yay: Rainier beer and Anchor Hophead vodka mixed with grapefruit juice, maple syrup and bitters (the tall glass in the image below). An honorable mention goes to the Via Veneto: a deeply rich, almost creamy blend of Cognac, Aperol and Starbucks coffee (third from the left). 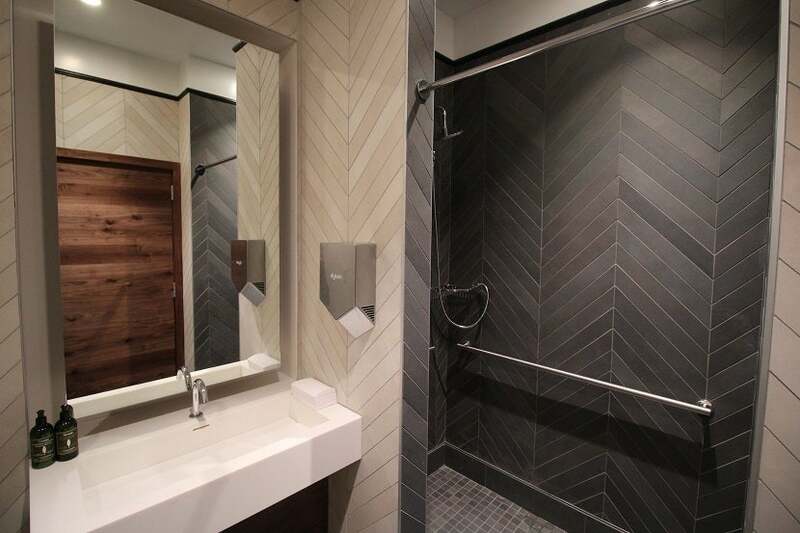 Another major update is the two new restrooms tucked into the rear of the expansion, which doubles the number of available toilets in the lounge, and by itself is a welcome and necessary improvement. More importantly, one of new restrooms includes a compact shower suite, and while it’s distinctly smaller than its counterparts in other Centurion Lounges — too small to photograph comprehensively even with a wide-angle lens — it still offers sufficient privacy and will get you cleaned up just the same. The lounge also bears some new Seattle-centric design flourishes, including large prints of local icons like Jimi Hendrix and Ken Griffey Jr., as well as more subtle notes, like a Dale Chihuly book sitting quietly on one of the shelves above the bar. I visited the lounge yesterday (before it was open to cardmembers in general), so there were still a few finishing touches left to be added. Moooi lights similar to those found in other Centurion Lounges will be hung near the back wall of the expansion, along with raisable blinds to shade the south-facing windows. The shower suite will also be stocked with the standard amenities. One thing that hasn’t changed is the food, and while the menu has steadily improved since 2015, the lounge continues to operate without a full kitchen. The dining options here are a step down from what you’ll find at the other Centurion Lounges, but still better than what you’ll find in most airline lounges. Other than a few seats that were relocated by the doorway to the expansion, the original lounge space remains unchanged. Overcrowding is one of the most common complaints about airport lounges, and has plagued the Seattle Centurion Lounge nearly from the start. It’s great to see Amex taking strides to give cardholders a bit more elbow room, but I have doubts about whether this expansion will be enough. The Platinum Card from American Express has been promoted heavily around SeaTac Airport, so the lounge may end up being a victim of its own success. We’ll find out soon whether the new space is adequate to serve the growing community of cardholders in the area. While the jury may be out on the increased capacity, the updated lounge is a bounding leap in the right direction. There’s still room for improvement — for example, a flight board and more outlets around the center tables would be strong additions to the expansion. However, the renovations are tasteful and well-executed and I expect the new space will pass muster with anyone who visits. 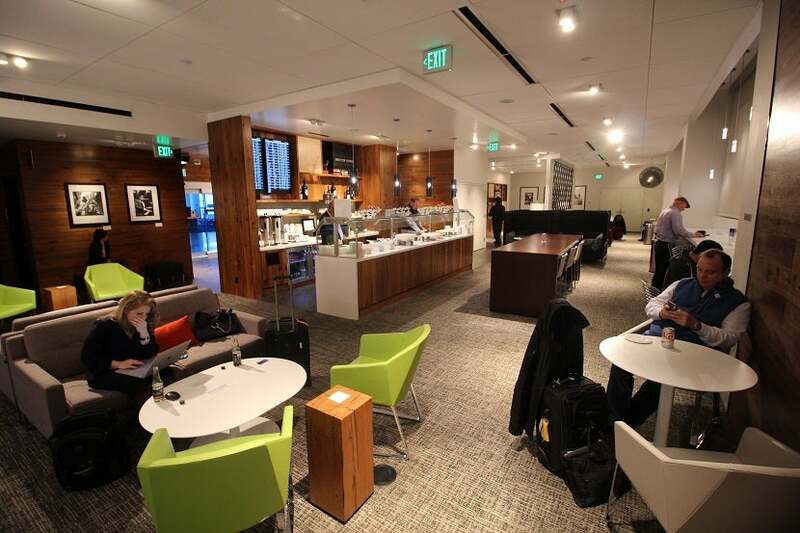 Have you had a chance to visit the new Seattle Centurion Lounge yet? Let us know what you think of it in the comments, below.